You need a commercial dishwasher to get things clean, without spending a fortune on maintenance, supplies, or water heating costs. We sell and rent commercial dishwashers to meet your unique requirements. We carry all kinds of models, including self-cleaning, high-pressure, low water, conveyor, and glasswashers. We service thousands of commercial kitchens across eastern Pennsylvania, New Jersey and Delaware. If your commercial dishwasher breaks down, we’re available 24/7 to get it working again. 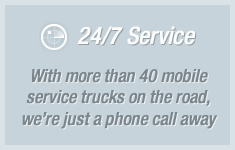 Plus, we have over 40 service vehicles to immediately address your issue. You will never miss a meal with Termac. If you’re ready for a commercial dishwasher backed by exceptional service, contact Termac.